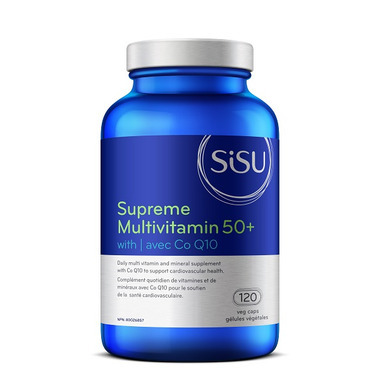 SISU Supreme Multivitamin 50+ is a daily multi vitamin and mineral supplement with Co Q10 to support cardiovascular health. Non-medicinal: microcrystalline cellulose, silicon dioxide, magnesium stearate (vegetable). Dosage: (Adult) Take 2 capsules daily with food or as directed by a health care practitioner. For adult use only. Take a few hours before or after taking other medications. Considering that this is a product intended for older adults, how disappointing to include in the bottle a not-to-be-ingested Desiccant which could so easily be confused with the vitamin capsules? I buy these for my mom. She loves them. No complaints about this vitamin. Appear to be good quality. Most info needed can be found on the label. Sisu is a well known brand.